Did I scare you? 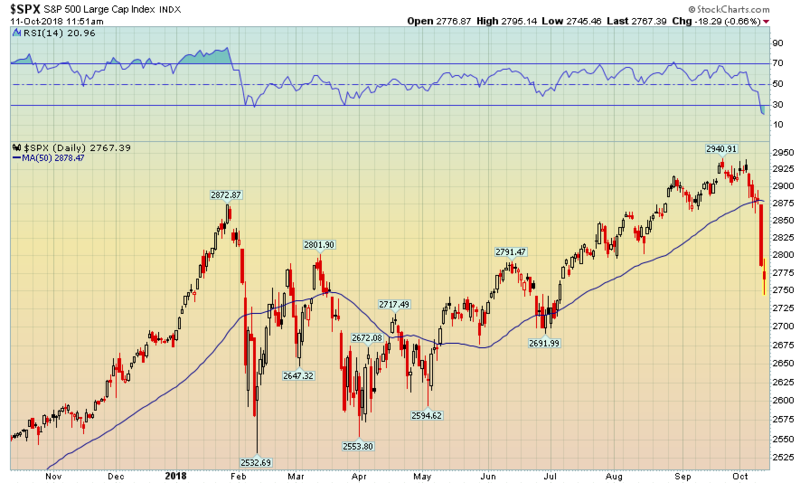 Well, if that didn’t do the trick, what about those big red lines you see on the S&P 500 chart below? Do they scare you? This month certainly has the market spooked. Rising interest rates, the ongoing trade war, and plenty of other unknowns sent the Dow down over 800 points on October 10th. YIKES! This sounds like a lot but in reality, it’s a little over 3%. It is still a lot for one day, so allow me to provide some perspective. First, it would be weird for these kinds of pullbacks not to happen. 2017 was an odd year, but 2018 is shaping up to be more typical. We are seeing the third major selloff in major indices this year, and it looks very similar to the ones we saw in February and March: a lot of selling with no flight to safety, and program trading which is sending stocks down rapidly for no fundamental reason. Second, if the market is going to have a pullback in the midst of a bull market, I’d rather it happen quickly and move on. Who wants to see the market moving down slowly for two months and then take another two to recover? Let the air out of the market, do it in a few days, and we can all get on with our lives. 2. After a recovery rally, assess if your current risk tolerance is right for you. If this pullback made you run to your computer in a cold sweat to check your account balances at 2 a.m., maybe your allocation is too aggressive. It’s easy to say you’re an aggressive investor in an up-market, but what about during the rough patches? If you’re getting queasy, call your advisor to reassess your risk tolerance. This is most likely a non-event for most investors. Don’t panic and try not to make emotional decisions about your accounts in times like this. If you need to talk, please pick up the phone and call us. We’ll walk you through how you’re invested and why. Regardless, you can rest assured that we’re paying attention to what’s going on out there. The S&P 500 Index is a capitalization-weighted index made up of 500 widely held large-cap U.S. Stocks in the Industrials, Transportation, Utilities and Financials sectors. The Dow Jones Industrial Average is a widely followed market indicator based on a price-weighted average of 30 blue-chip stocks that trade on the New York Stock Exchange which are selected by editors of The Wall Street Journal.